One month after Sijara Eubanks had hoped to face Valentina Shevchenko for the vacant flyweight championship, she will now be exiting the flyweight division (125) and entering the bantamweight division (135) according to her manager, Ali Abdelaziz. Eubanks’s struggles to make weight at 125 has been well documented. After earning her way to the finals to face Nicco Montaño for the right to become the first ever flyweight champion, Eubanks was unable to compete in the finale due to failing to make weight. 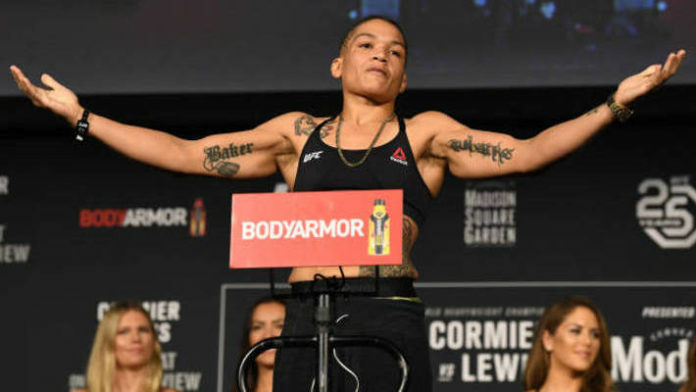 Sijara Eubanks was able to make weight for her next flyweight bout against Lauren Murphy, which saw Eubanks pick up the unanimous decision victory at UFC Fight Night 131. Sijara Eubanks was then booked to face Valentina Shevchenko to headline UFC 230 in Madison Square Garden for the vacant flyweight championship, but that fight was later scrapped in favor of Daniel Cormier defending his heavyweight championship against Derrick Lewis. Eubanks was very vocal in her frustration about the cancellation, only to once again miss weight prior to her unanimous decision victory over Roxanne Modafferi at UFC 230. Eubanks was then met with enormous criticism for missing weight once again after being so vocal about her flyweight title bout against Valentina Shevchenko being pulled and appearing to show no remorse after the fail. Eubanks is now ready for a fresh start at bantamweight, a division in which she has never competed in the UFC and in which she is 2-1 in her career. Do you believe Sijara Eubanks will have the same success at bantamweight?